Looking to upgrade multiple bulbs within my house, one issue I came across was the price. Although, I love the LIFX bulbs and have been pleased with the quality, changing light bulbs throughout the house was going to be expensive. With this in mind I did a bit of searching and discovered the OSRAM Lightify bulb. Through trawling through the SmartThings forum I discovered that these were compatible without buying an additional bridge. They retail on Amazon for around £15, however they only sold screw fit (which meant I had to buy an adaptor). I did try to email them to find out if they did the bayonet fit, however no one replied. I did finally get an answer from twitter after a few days. One rant about the industry is that some of the companies lack communication, both lightify and fibaro have been guilty of not replying with simple requests. However that is a blog for another day. When the light bulb arrived the packaging was neat and presentable. However I opened the packaging and found the bulb with a dirty and marked trim. The bulb seemend like it was a refurbed bulb rather than a brand new which gave off a poor impression. In the end I decided against complaining as the light was going to be under a shade and therefore barely visible. I’d read previously about difficulties connecting the bulb to Samsung SmartThings, so I was aware of the potential issues. However the most frustrating part of the experience was using lightifys reset functionality. Which we shall discuss in more detail in the first step. For this process you had to first reset the bulb which put it in connecting mode. This involved turning the bulb on/off for 5 times and with 5 second gaps. This turned out to be quite a difficult and time consuming task (maybe 3 times might have been sufficient). After the 5th time you then need to wait for a flash (this took several attempts but I finally received it) and click ‘add a thing’ on the SmartThings app. Hopefully (on one of your attempts) your device will be discovered. SmartThings won’t fully recognise the device at this stage, however it will appear within the list as ‘a thing’. Click ‘create’ and make sure it’s published. It should appear in your my device handlers list called smartthings : Lightify Surface. 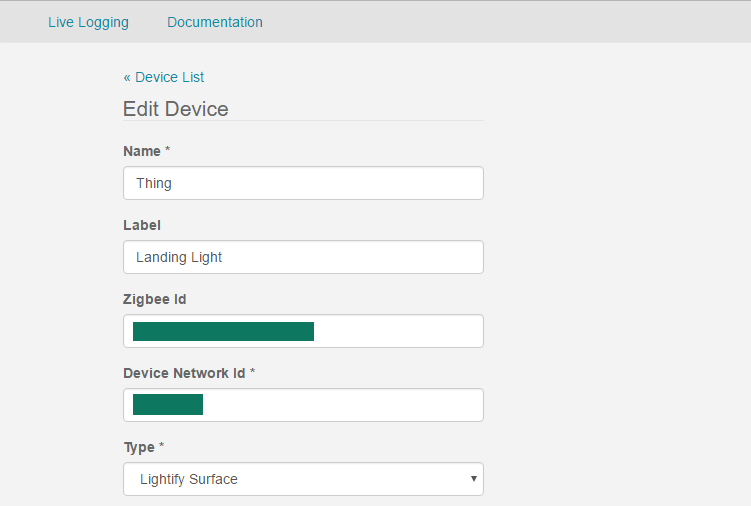 Finally the finished step is to set assign the device handler to the device. Go to the ‘my devices’ tab and locate the bulb which will be named ‘thing’. Update the relevant settings such as name of device and make sure you change the ‘type’ to ‘lightify surface’. This will be located at the bottom of the list (save time looking through them like I did). Your new device should be now recognised. 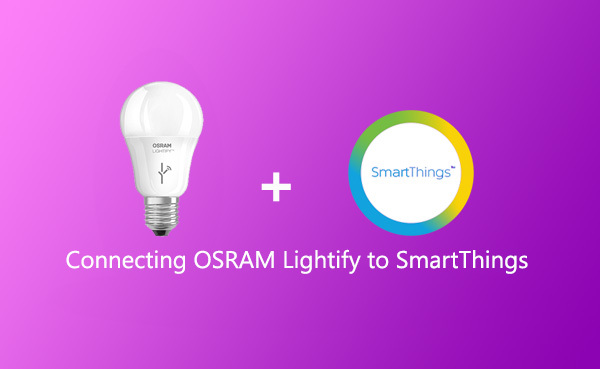 Open the SmartThings app on your phone and the light should be responsive. The Lightify bulb is now working and so far so good without any issues. The only trouble is the dim functionality only seems to work less than between 1-10% and just full brightness above that. However for what they were brought for this isn’t really an issue for me. However if you wanted them to adjust the mood, this could be an issue. As I’ve only run them for a short period of time, it’s unfair to comment on how stable they are. As one drop out could force more to go through the whole reset process, only time will tell how good they are.